Now Canadians can save $5 on Paramount's animated hit by pre-ordering from Amazon! 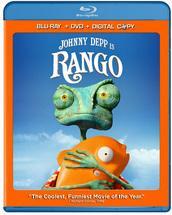 This time we have another Canadian offer to save $5 on 'Rango' Blu-ray available on July 15! Simply visit this page to add the Blu-ray or DVD to your shopping cart and enter the code RANGDEAL during checkout. The code is valid for only one item, and can be used only once per customer. Offer ends on July 23, 2011.